Korup Rainforest Conservation Society - KRCS - Involving local people for a greener future! 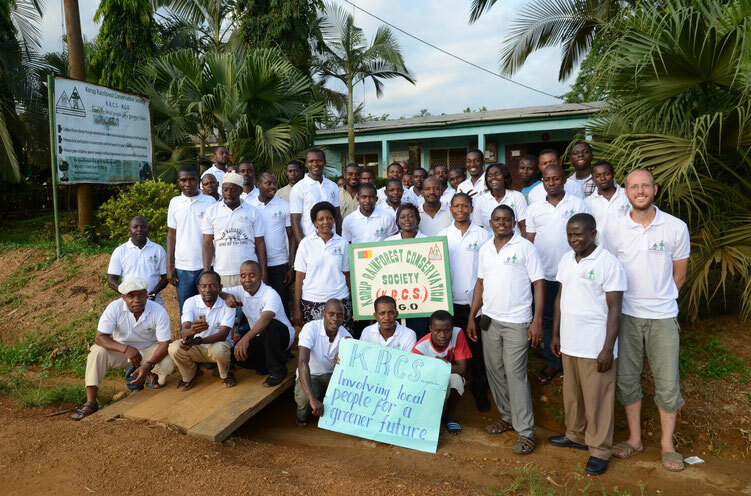 KRCS members pose outside their head office in Mundemba. KRCS is a Cameroonian, legalised non profit organisantion of local persons from the Korup National Park (KNP) area, committed to mobilizing local people and contributing their expertise towards ensuring the integrity of the rich tropical biodiversity of the Korup park and surrounding forest and mangrove ecosystems geared towards livelihood improvement for the less privileged, forest dwelling and forest dependent local communities. KRCS was created in 2009 and works in partnership with local communities, KNP and other national and international stakeholders to achieve its conservation and livelihood improvement goal. We have a good record and experience in supporting and implementing conservation activities (especially wildlife research) and livelihood improvement innitiatives in local communities, which we have found key to our work.